(PhysOrg.com) -- A team of Yale University researchers has discovered a "repulsive" light force that can be used to control components on silicon microchips, meaning future nanodevices could be controlled by light rather than electricity. The team previously discovered an "attractive" force of light and showed how it could be manipulated to move components in semiconducting micro- and nano-electrical systems—tiny mechanical switches on a chip. The scientists have now uncovered a complementary repulsive force. Researchers had theorized the existence of both the attractive and repulsive forces since 2005, but the latter had remained unproven until now. The team, led by Hong Tang, assistant professor at Yale's School of Engineering & Applied Science, reports its findings in the July 13 edition of Nature Photonics's advanced online publication. "This completes the picture," Tang said. "We've shown that this is indeed a bipolar light force with both an attractive and repulsive component." The attractive and repulsive light forces Tang's team discovered are separate from the force created by light's radiation pressure, which pushes against an object as light shines on it. Instead, they push out or pull in sideways from the direction the light travels. Previously, the engineers used the attractive force they discovered to move components on the silicon chip in one direction, such as pulling on a nanoscale switch to open it, but were unable to push it in the opposite direction. Using both forces means they can now have complete control and can manipulate components in both directions. "We've demonstrated that these are tunable forces we can engineer," Tang said. 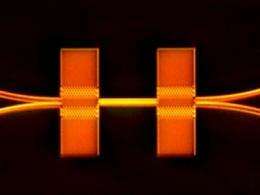 In order to create the repulsive force, or the "push," on a silicon chip, the team split a beam of infrared light into two separate beams and forced each one to travel a different length of silicon nanowire, called a waveguide. As a result, the two light beams became out of phase with one another, creating a repulsive force with an intensity that can be controlled—the more out of phase the two light beams, the stronger the force. "We can control how the light beams interact," said Mo Li, a postdoctoral associate in electrical engineering at Yale and lead author of the paper. "This is not possible in free space—it is only possible when light is confined in the nanoscale waveguides that are placed so close to each other on the chip." "The light force is intriguing because it works in the opposite way as charged objects," said Wolfram Pernice, another postdoctoral fellow in Tang's group. "Opposite charges attract each other, whereas out-of-phase light beams repel each other in this case." These light forces may one day control telecommunications devices that would require far less power but would be much faster than today's conventional counterparts, Tang said. An added benefit of using light rather than electricity is that it can be routed through a circuit with almost no interference in signal, and it eliminates the need to lay down large numbers of electrical wires. Can you do something similar with sound waves? Yes, this is principle of so called the "acoustic levitation". The very simmilar mechanism keeps atoms of BE condensates in optical lattice and this principle is known for years..
Can you use this as a non-volatile memory? Seems like this would make a viable "optical computer". Modulate the deflector beam phase!! Could this technology be developed to move nanoscale particles in a manufacturing process, such as the the production of virus size robots? Drest-up halfnews. In easier words, they constructively interfer two inverse magnetic componends of infrared so it makes radio or near-DC. And fast is not a speed; glue is fast. ..to move nanoscale particles in a manufacturing process.. Yes and it's utilized as so called optical tweezers. The problem of article is, it's not comprehensive and it makes a huge new invention from well understood phenomena - so that readers tend to reinvent wheel while reading it.